Tropical Storm Ana earlier this month aside, June 1st marks the beginning of the “official” Atlantic Hurricane season. So what can we expect this year? Exact predictions are always iffy, but noted expert Dr. William Gray and his colleague Philip Klotzbach, both of Colorado State University, predict 7 named storms, three hurricanes and one major hurricane. If true, this would be one of the quietest hurricane seasons in the last 60-years. The long term average is for 12 named storms, six hurricanes and two major hurricanes. Some recent years have seen in excess of 20 named storms. Why the smaller numbers? One factor is the development of a strong El Nino in the equatorial Pacific Ocean. Historically, El Nino years have fewer hurricanes along with other effects. The Weather Channel has created a nice page and video explaining this. It is extremely important to note, however, that it only takes one major landfalling hurricane to cause vast damage and many casualties. Just because the long range hurricane forecast seems to be encouraging, we’re not out of the woods. In preparation for the 2015 hurricane season, the National Hurricane Center is unveiling a new system of communicating storm surge threats and vulnerabilities. 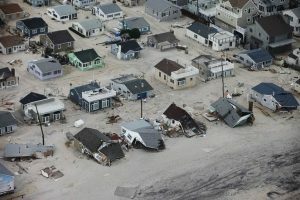 As has been seen over and over, some of the most devastating damage from hurricanes is not always from strong winds but from storm surge, the wall of water that is pushed out in advance of the center of the hurricane. Hurricane Sandy is one of the more recent demonstrations of this mighty force. This week, May 24-30, is national Hurricane Preparedness Week. For those of you who have a role educating others about hurricanes here’s a link to FEMA’s toolkit. And here is material from the National Hurricane Center/NOAA. National Dam Safety Awareness Day is May 31st. That date is the anniversary of the failure of the South Fork Dam which resulted in the infamous Johnstown (PA) flood. 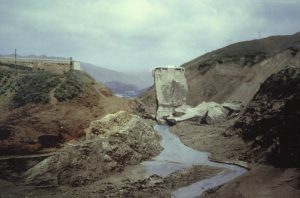 More than 2,200 lives were lost in what is considered the worst dam failure in the history of the United States according to FEMA. The National Dam Safety Program is led by FEMA and a partnership of states, federal agencies and other stakeholders. Dams are part of an aging infrastructure and continued attention is vital in averting future catastrophic failures. 62 years ago this month, April 9, 1953, about 3 miles from where I am sitting, a tornado was caught by radar for the first time. Scientists and electrical engineers at the Illinois State Water Survey at the University of Illinois at Urbana-Champaign had modified a former WWII airborne radar for use in estimating amounts of precipitation falling from storms. Don Staggs, an electrical engineer, was preparing the radar for later field tests. He started to notice what we now call “hook echo” returns in the scans of the storm. As afternoon turned to evening, a strong thunderstorm developed just north of Champaign, about ten miles from the radar site at the university-owned Willard Airport. The storm image included a pronounced hook on the bottom rear flank much as we see hook echoes on modern Doppler radar. Still photos and a 16mm film of the images on the scope captured that moment. A team of meteorologists and technicians were able to study the image capture. Later, Dr. Ted Fujita the creator of the tornado strength measurement scale that bears his name, sketched over 200 of the frames of the film in his own hand. All of this can be seen in a terrific article from Colorado State University. Note especially the photos of the tornado and the well-developed wall cloud. 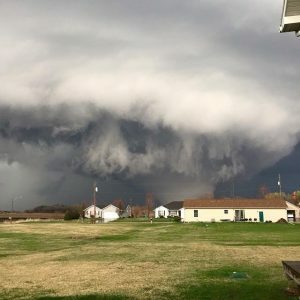 We now know that the radar captured the early stages of an F3 tornado that eventually traveled about 160 miles and dissipated near Albany, IN. 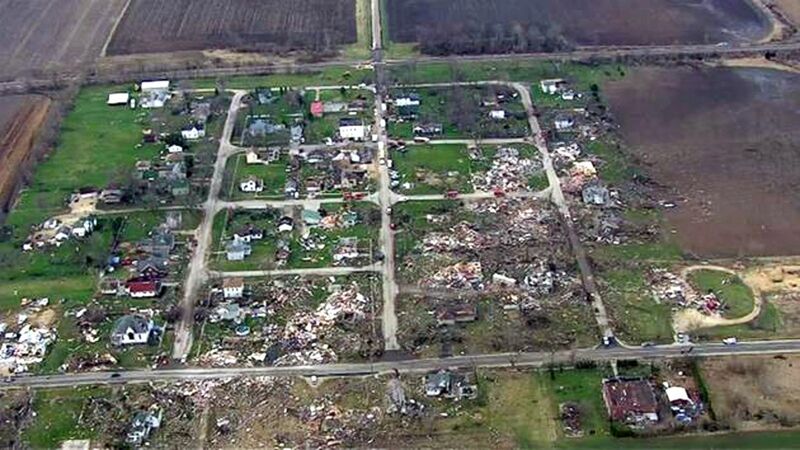 There were two fatalities and about $4-million in property damage in Illinois. The path of the storm took it across mostly rural areas. Next week, we’ll discuss current use of radar and what may be the next generation of this important forecast tool. On this Tax Day edition of Weather Wednesday, we’ll revisit last week’s tornado outbreak in Illinois. Statewide, 11 tornadoes have been confirmed in the April 9th event. 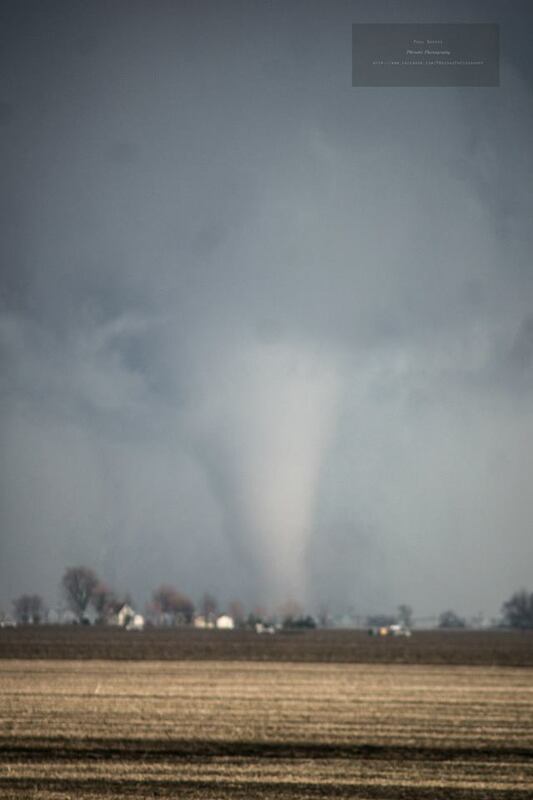 The earliest, which caused very little damage, was reported just northwest of Peoria in the afternoon hours. 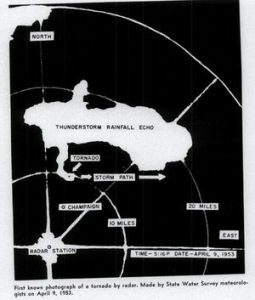 By early evening, strong thunderstorms were crossing far northern Illinois and eventually spawned the first EF-4 tornadoes ever reported in DeKalb and Ogle Counties (records kept since 1950) and the strongest tornado in the National Weather Service Chicago Office County Warning Area since an EF-5 devastated Plainfield, in the southwest suburbs, in 1990. 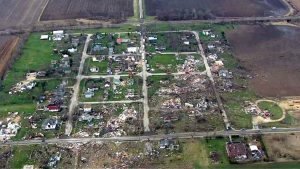 Two people were killed in the unincorporated town of Fairdale where nearly every structure, more than 70 in all counting outbuildings, was either damaged or destroyed. 22 injuries were reported in the outbreak. 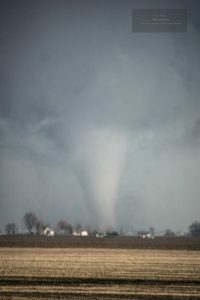 The tornadoes eventually approached the far western suburbs of Chicago but missed three population centers near their path. Damage was widely scattered in a multi-county area. This outbreak was well forecast and there is general agreement there was plenty of warning. The Storm Prediction Center (SPC), as it did with the EF-3 and 4 tornadoes in Illinois on November 17, 2013, mentioned possibly tornadic storms at least four days in advance. The National Weather Service Chicago Office updated their summary of the tornadoes just this morning. This is one of the most complete such documents I’ve ever read and includes some of the few satellite images of a tornado’s path I’ve ever seen. Read it all the way to the bottom and you’ll see the SPC guidance in the week leading up to the storms. Wedge tornado and wall cloud near Hillcrest, Illinois. Larissa Sebree via NOAA. A couple of these tornadoes were extremely well documented via video (note: Strong language toward end) and live streaming and some of the visuals of the rotating wall clouds were just about textbook. The low sun angle contributed how well the tornadoes were captured. There were a couple of takeaways from his experience which are good reminders to all of us who may encounter storms. First, if a funnel cloud or tornado does not appear to be moving, it is either headed straight for the observer or dead away from the observer. To be safe, get out of that area immediately by driving at right angles to the storm. Second, this motorist backed up to take shelter in his vehicle under a bridge. Although many people have done that and survived, experts say that is a bad idea because wind speed may actually be amplified as it is compressed into that confined space. There have been fatalities of people under overpasses.